Of all the shellfish available my favorite are scallops. They’re tender, sweet and have just a slight taste of the sea. When I prepare them I like to keep things simple. Salt and pepper are all you need to accent their natural yumminess! Here’s a simple and easy recipe for pan searing them. Total cooking and prep time – including the pan sauce – is about 20 minutes. That means you can serve scallops any night of the week so go ahead and indulge! Pat the scallops dry with a paper towel. If they’re damp, they’ll steam and not sear. Season the scallops lightly with salt and pepper. Add the oil to the pan. Sear the scallops about 3 – 4 minutes on each side depending on the size of the scallops. Do not disturb while they cook so they create a deep golden crust. 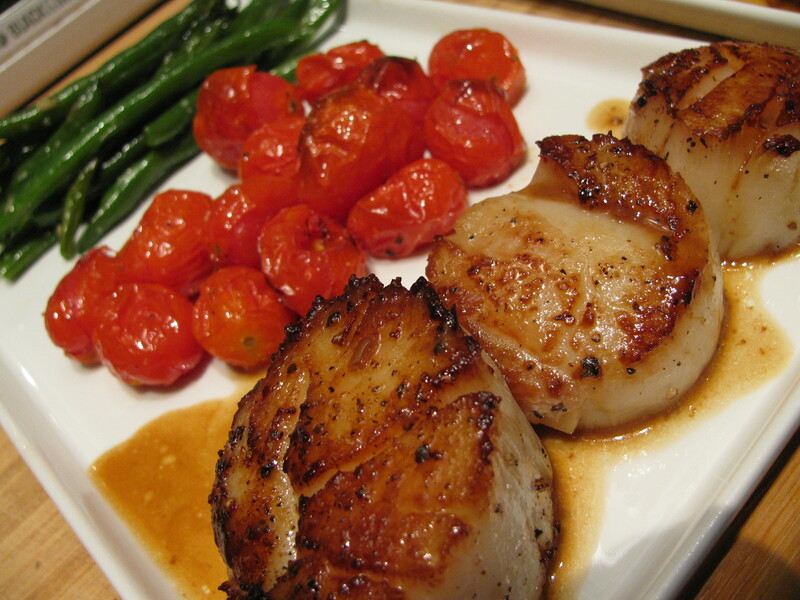 Place the scallops in a dish and cover with foil while you make the pan sauce. Turn the heat down to medium, add the white wine and the thyme (if you’re using it) to the pan and deglaze the pan. Cook for about 2 minutes. Take the pan off the heat, add the butter to the sauce and swirl the pan around gently incorporating the butter into the sauce. Remove the thyme stems from the sauce and discard. 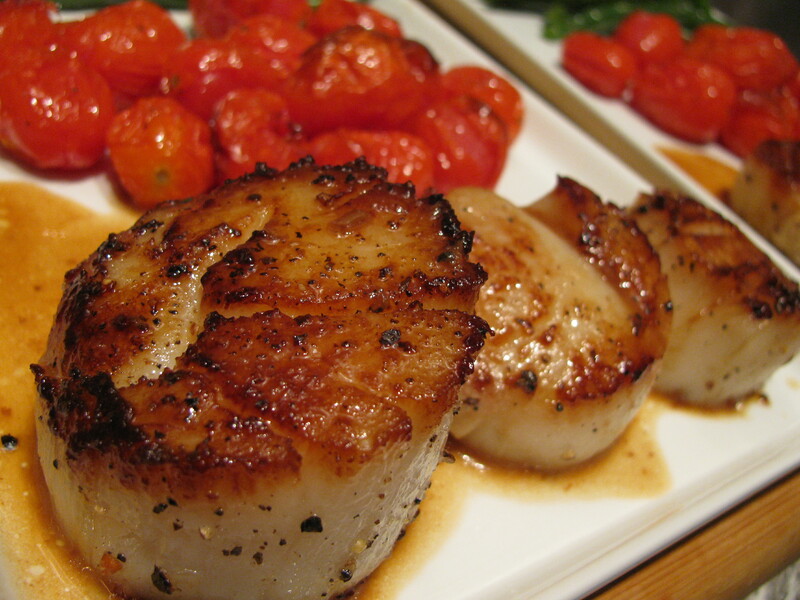 Serve 2 – 3 scallops per person. Spoon 1 tsp of the pan sauce over the top. Serve immediately. The day I made this I served them with Mom’s Pan Fried Green Beans (see the recipe here on the blog) and oven roasted tomatoes. They would also go well with just about any vegetable. How about oven roasted potatoes or asparagus? Can’t find sea scallops? Try the smaller and sweeter bay scallops. Just cook them for 2 – 3 minutes per side instead to avoid over cooking. Don’t like scallops? Try prawns instead….yummy!! Deglazing – As the wine boils and reduces, scrape the bottom of the pan to get all the lovely crusty bits. This process is called deglazing. All those flavorful crusted bits will dissolve into the pan sauce making it rich and tasty! Remember that color equals flavor and all those browned bits are concentrated with flavor. Anytime you sear a protein consider making a pan sauce….why waste all the concentrated goodness? Don’t overcook the scallops! Just like shrimp, scallops will turn tough and rubbery if they’re overcooked. You can tell they’re done when you press them likely with your finger and they spring back slightly. Error on the safe side and take them off the heat sooner rather than later. Food continues to cook even after it’s taken off the heat and if needed you can always put them back in the pan to cook longer. Those scallops look fabulous! Love the sear!